So we start out *not knowing* what we don’t know. It takes time to learn what we don’t know. As we observe life and listen closely, we begin to figure out what it is that we don’t know yet — in other words, we begin to learn the right questions to ask. Teenagers are a good example of this evolution in understanding. They are nearly full-grown physically, and discovering their full intellectual abilities. So many teenagers have that cocky know-it-all attitude enabled by the fact that they’re still living at home, sheltered from the big bad world. Within several years of getting down to the business of jobs, food, clothing, and shelter, their confidence is tempered with the knowledge that they are just discovering the tip of the iceberg. And their parents don’t seem so witless after all. Inevitably, young adults return to their parents saying, Now, I understand. As much as adults want to teach their children, and perhaps save them from painful experiences, we often can’t. We must live the lessons. I have been a writer since I can remember, as a child scribbling lines on paper. I think it sprung from my duality as inward-looking and enthusiastic; shy, but extremely empathic and curious. In grade school, I became conscious of arranging words in my head. I was always, almost compulsively, working out descriptions for joy, snow, the woman at the cafe, and the tired man on the train platform. I vaguely remember the surprise of recognition that everyone didn’t do this. Fast forward to college, when I was encouraged to pursue writing as a career (although I was preparing for law school). When I arrived at Columbia University Graduate School of Journalism, I was quite shy and even star-struck by the pool of talent I was now swimming in. I was an innate, intuitive writer who knew nothing about writing a news story. And I was a curious, but timid, student of human nature. As time progressed, I learned to slip into the protective skin of a journalist. One of the most important things I learned was the art of interviewing. It’s not just about the questions you ask; it’s about silence. It’s not just about the answers spoken; it’s about the answers articulated in body language. The good news is that the older I get, the livlier my internal dialogue becomes. 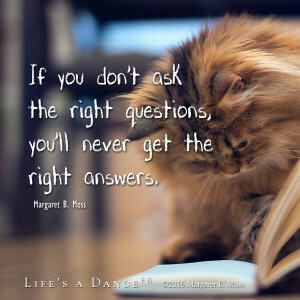 I am learning the right questions to ask, and I am beginning to get some of the answers. Fascinating memoir, I have wondered about your literary origins from your Facebook memes and posts. Thanks for sharing. Good stuff, MBM. Spot on. (My dad, a lawyer, taught it as “If you get the wrong answer, you’ve asked the wrong question.”) Peace, Dan.